Home prices and housing starts have recovered since the recession. This housing boom does look like a bubble ready to burst. Debt levels in relation to incomes are much lower, so this bust potential is less worrisome. 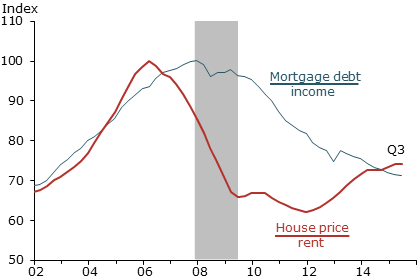 During the last boost, home prices peaked in 2006, fell 30 percent on average and bottomed out in 2011 when mortgage-related debt was out of control. “The current run-up exhibits a less-pronounced increase in the house price-to-rent ratio and an outright decline in the household mortgage debt-to-income ratio — a pattern that is not suggestive of a credit-fueled bubble,” says the new report, “What’s Different About the Latest Housing Boom?,” released by the Federal Reserve Bank of San Francisco. Home prices peaked in 2006, fell 30 percent on average and bottomed out in 2011. Could it happen again? The researchers examined three indicators going back to the year 2002: the median U.S. house price, the number of private-sector workers employed in construction, and the number of new housing starts, including both single- and multi-family homes. The increase in the median house price since 2011 differs from the prior run-up. Source: Flow of funds, Bureau of Economic Analysis (BEA), CoreLogic, and BLS. Data are seasonally adjusted and indexed to 100 at pre-recession peak.